Vishal Rana was one of the main accused of leading a furious mob on September 28, 2015 on the home of Mohammad Akhlaq on suspicion of consuming beef at home. A day after Akhlaq lynching case prime accused Vishal Singh Rana was found sitting in the front row at Uttar Pradesh Chief Minister Yogi Adityanath’s election rally, the Congress on Monday accused the saffron party of trying to polarise the voters. “The BJP knows that it has lost the elections and thus they are trying to polarise the voters ahead of the polls,” Congress spokesperson Surendra Rajput told IANS. His remarks came a day after Adityanath visited the Bisada village to address a rally in favour of Union Minister Mahesh Sharma, the Bharatiya Janata Party candidate from Gautam Buddha Nagar in the 2019 Lok Sabha polls. Vishal Rana, a resident of Bisada village in Dadri area and son of BJP leader Sanjay Rana, was one of the main accused of leading a furious mob on September 28, 2015 on the home of Mohammad Akhlaq on suspicion of consuming beef at home. He is currently out on bail. Besides Rana, another accused, Puneet was also seen sitting in the front row and chanting for the BJP and Adityanath. Akhlaq was lynched shortly after the loudspeaker in the village temple was used to announce that the 50-year old Muslim man had slaughtered a calf. After the announcement from the temple, fellow villagers broke down the door to his house and searched it for beef. Akhlaq was killed and his family members injured. The Uttar Pradesh Police had arrested 18 people in connection with the case, out of which seven were said to be the relatives of Sanjay Rana. In the charge sheet, Vishal has been booked under several sections of the Indian Penal Code, including for murder and attempt to murder and others. However, the charges are yet to be framed in the court. 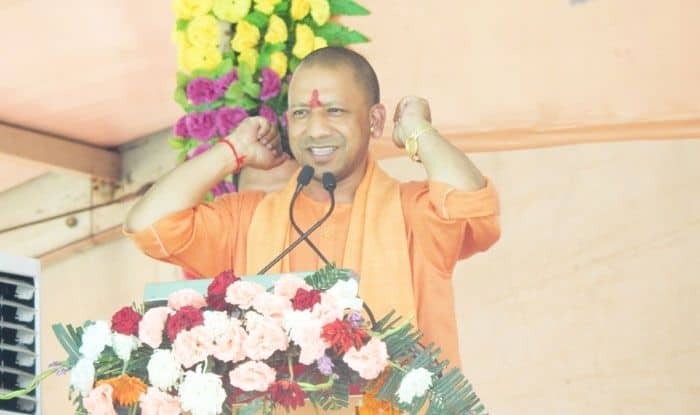 While addressing the rally in Bisada, Adityanath slammed the former Samajwadi Party and the Bahujan Samaj Party governments for letting illegal slaughterhouses run without any check and trying to “suppress sentiments”.